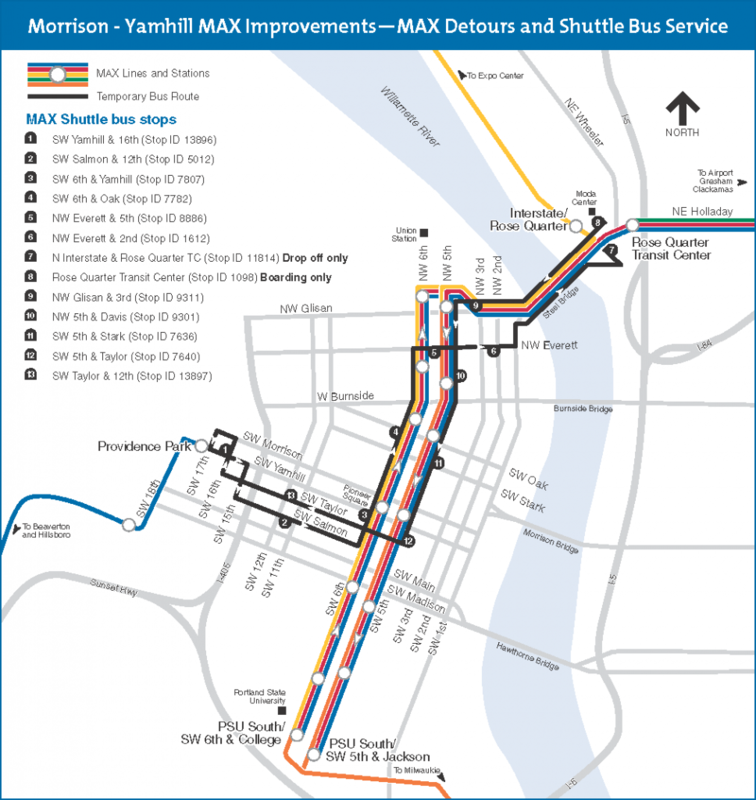 TriMet kicks off another major track project – the Morrison-Yamhill MAX Improvements project – on Sunday, April 30. Crews will be rejuvenating sections of the oldest MAX alignment along SW Morrison and Yamhill streets at 11th and 1st avenues in downtown Portland. Similar to the improvements made during two projects last year (1st Avenue/Rose Quarter), this work is being done on the oldest section of the MAX system that has been in service more than 30 years. However, this spring’s project will require a longer, three-week disruption to MAX service as well as a two-week disruption to Portland Streetcar. We ask riders for patience and understanding as these upgrades are necessary to renew a system of this age as we work to increase reliability and make the ride better. Crews will be working on Morrison and Yamhill streets at Southwest 11th Avenue, near what was originally the end of the first ever MAX line that went into service in 1986. They’ll be removing wooden ties, improving the track bed, upgrading switch machines and replacing special track work. Further east, crews will replace curved rail at the corners of 1st and Morrison and 1st and Yamhill. (This work is weather permitting.) The projects reflect TriMet’s reinvestment into the MAX system to increase the resiliency of the system and keep trains running on time. The work also will make the ride smoother for our customers and benefit pedestrians, cyclists and auto drivers as well. From Sunday, April 30 through Saturday, May 20, MAX service on Morrison, Yamhill and 1st Avenue will be shutdown; Blue, Green and Red lines will be disrupted; and trains on all lines will be running less often. Blue and Red Line stations between Providence Park and Rose Quarter will be closed. Only the Blue Line will be running on the west side between Hillsboro and Providence Park Station. Blue and Red lines will be detoured to 5th and 6th avenues in downtown Portland, which worked well for riders during the 1st Avenue MAX Improvements last spring. MAX Green Line will only run between Clackamas and Rose Quarter, and will not go into downtown Portland. Trains on all MAX lines will run less often and on special schedules. Shuttle buses will run between Providence Park, 5th/6th avenues and Rose Quarter. Due to separate sewer construction, shuttle buses will be running on SW Salmon and Taylor streets. From Sunday, April 30 through Saturday, May 13, all Portland Streetcar lines will be disrupted due to the construction at SW 11th Avenue. While Streetcar operations will resume through 11th Avenue beginning Sunday, May 14, MAX and auto traffic will remain disrupted as crews complete improvements there. There will be no streetcars running on 10th and 11th avenues, and the A and B Loop service will be suspended. 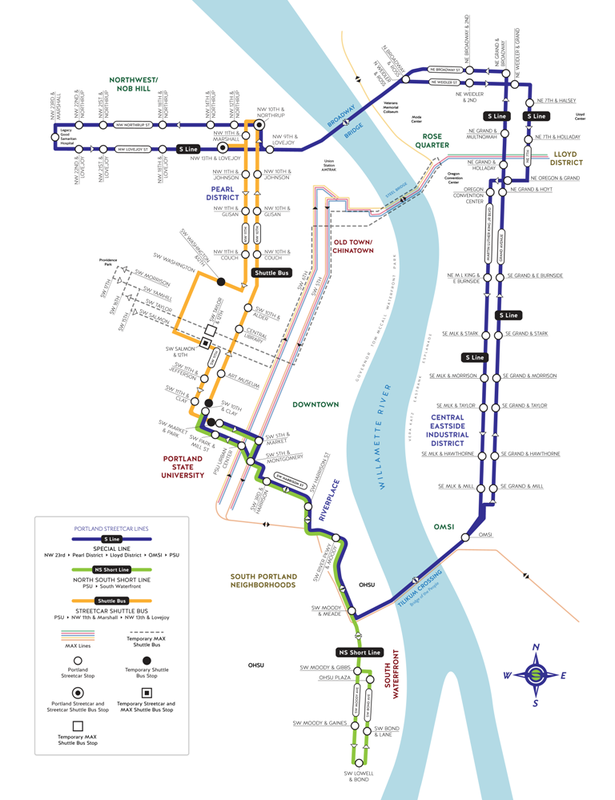 The NS Line will only run between Portland State University and South Waterfront. Shuttle buses will serve most Streetcar stations on 10th and 11th avenues, as well as some temporary stops. A special route, the S Line, will operate between NW 23rd & Marshall and SW 10th & Clay/SW Park & Market, via the east side. Streetcars will operate on special schedules, but the frequency will be similar to regular service. Streetcar riders should plan an extra 15-20 minutes for trips. Portland Streetcar arrival information can be found at org. Those riding MAX during the improvement project should plan at least an extra 30-45 minutes for their trips. Expect very crowded trains during commuting hours. You may not be able to get on the first train that comes. Consider altering trips to avoid commuting hours or take regular TriMet bus service, carpool, work from home if possible or use alternate transportation, including Portland Streetcar, especially during the final week of the project. Biking, including using Portland’s BikeTown bike-sharing program is a great option as well. May is The Street Trust’s Bike More Challenge and, due to crowded trains, cyclists should consider biking all the way to destinations. To prevent delays as room for bikes onboard MAX will be very limited, also consider using bike parking at a station or leaving the bike at home during the three-week project. Those bringing large suitcases or strollers on board during commuting hours may have a longer wait. Use TriMet’s online Trip Planner to plan your ride. The Trip Planner as well as TransitTracker will reflect the service adjustments during the project. You can now call TriMet’s customer service call center, 503-238-RIDE (7433), to get personal trip planning help seven days a week between 7:30 a.m. and 5:30 p.m.
TriMet staff will work to inform customers about the changes to service and be at key stations during the project to help riders get where they need to go. More information can be found on org/morrisonyamhill.